No family vacation to Rajasthan is complete without a visit to the golden city of Jaisalmer – the land of ancient majestic forts. 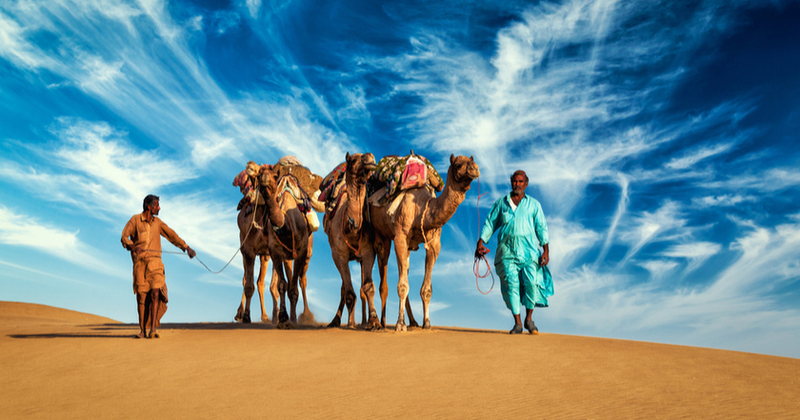 The city is a gateway to the Thar Desert, and it has stood strong for thousands of years. A paradise for explorers and adventurous tourists, there’s a wide variety of things to do in Jaisalmer. Among the many places to visit in Jaisalmer and experiences to indulge in are Jaisalmer Fort, Gadisar Lake, BadaBagh, Jaisalmer Desert Safari, and the Desert festival. The city’s rich heritage is unmissable – its vibrant art, folk music, dances, and festivals forge a connection with every visitor. Also, there’s scrumptious Rajasthani food to be devoured, the most famous of them being Gattekisabzi and Daalbaati. While you indulge in a royal repast, don’t forget to try Ker sangri (desert beans) and Murgh-e-subz (fried chicken strips with vegetables). Having said that, what you absolutely cannot miss when it comes to experiences and places to visit in Jaisalmer is the Jaisalmer Desert Safari. While the safari itself typically takes 1-2 hours, you can enhance this experience by camping overnight in the desert. The best way to go about this is to contact one of the safari camps and book in advance. Most of them will take you to Sam sand dunes, but there are a bunch of other dunes that you can opt for as well. This is best enjoyed at either sunset or sunrise. A maximum of two people can sit on a camel, and fares start at Rs 500 per person. These tours start and finish at the campsite. If you choose to make it a night stay, some camps offer buffet dinners, bonfires, and an overnight stay beneath the starry night sky. Dances and village tours can be enjoyed at an additional cost. The package cost varies according to the services provided. Club Mahindra members can choose to have their itineraries planned by in-house experts, who can obtain the best packages for your family vacation. While the timings remain the same, this safari is in a 4×4 vehicle that can accommodate up to five people. These start from the campsite and take you to different sand dunes, which can be 30-50 meters tall. Sample charges for just the safari could be Rs 2000 for the whole vehicle, Rs 1000 for three, and Rs 750 for two. The ride includes lot of drifting, so if you happen to enjoy roller coasters, a Jeep safari will be a highly thrilling experience. • Do your research on the dunes; the popular ones might be crowded. • Don’t eat/drink anything too heavy before the safari. • The days are warm but the nights can be very cold, so prepare accordingly. • Carry some dry snacks and stay hydrated. If you are planning a trip to Jaisalmer, allow us at Club Mahindra Jaisalmer Resort to be your hospitality partner. Check out the Club Mahindra reviews online – they all speak of the comfortable rooms and the delectable local delicacies served at the in-house restaurant. The Jaisalmer Resort has been designed in the typical haveli style to give you a supremely royal experience. This entry was posted in Jaisalmer and tagged camel safari in jaisalmer, desert safari in jaisalmer, desert safari in rajasthan, jeep safari in jaisalmer. Bookmark the permalink. ← Why Should You Spend Your Holidays In India?